I was approached by UncommonGoods and asked if I would create a blog review of some items they have available to purchase in their Mother’s Day collection. Of course, I jumped at the chance! UncommonGoods is a company based in Brooklyn, NY (where you can visit and have studio tours!) and they have been awarded for their outstanding customer service every year since 2007. I can say in my interactions with them, they deserve that recognition! After a few brief emails my items were on the way. I had a very hard time choosing what I would like to receive as there were many beautiful items available to choose from! My selections were the White Potato Parchment earring set and the Chakra Stone Chime. When you’re looking for something special for your mother this Mother’s Day, I suggest checking out UncommonGoods Top 25 Gifts for Moms: http://www.uncommongoods.com/curated/top-25-gifts-for-mothers, and if your mother is more of the gardening type, there’s a page for that too! http://www.uncommongoods.com/fun/by-interest/gardening-gifts After browsing these pages myself I saw a number of things that would suit my mother, and myself! After reading over UncommonGoods’ website I found that they are a B Corporation. I didn’t know what that meant so I Googled it. Turns out B Corporations use their business power to help solve social and environmental issues. When a business has the B seal it means they meet strict standards in the areas of wage levels, environmental impact and giving back to the community. Sounds like good business practices to me! It took about 10 days (including a weekend) for my products to arrive. They were well packed inside their box – nothing likely moved through their entire journey. Of course the box came with bubble paper, which is always a hit with my kids. That kept them occupied while I actually opened the boxes! The earrings are breathtaking. They’re made from dried and treated vegetables – these ones are potato and papaya. They look so delicate I’m almost afraid to wear them! I did put them on – they hang a little low for my liking. If I were wearing something with a collar they would be brushing against it. Also the metal is quite soft – you can bend it, which was good for me as one seemed to be floating far out from my neck, so I was able to gently bend it back in. I feel like if I do that many more times the slender post will break. Overall these are gorgeous, but I think they will be put away for special occasions. Too delicate for frequent wearing. Now the chimes, on the other hand, are quite robust. The entire piece is a bit smaller than I had imagined, but after reading some reviews online I knew they weren’t very large. 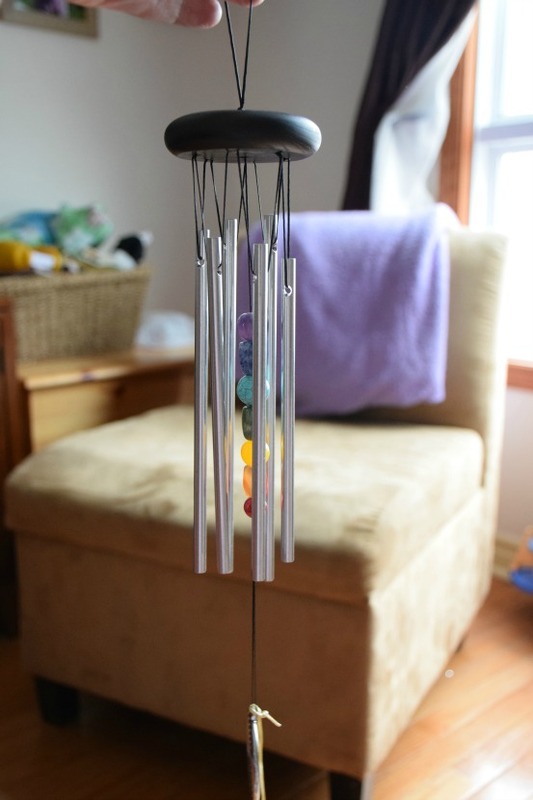 Indoors they create quite a loud chime, but outdoors they will be the perfect backyard garden sound. I really enjoy the hanging chakra stones. They make it feel like just listening will help your energy become aligned. I look forward to hanging these chimes outside to be enjoyed on warm summer evenings. My entire experience with UncommonGoods was fabulous. Their website is easy to navigate, the products arrive in a timely fashion and the items are beautiful. I’d recommend them for your Mother’s Day shopping! What a wonderful idea – B Corporations are. 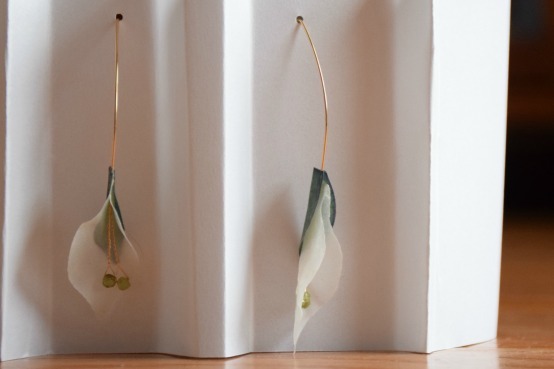 The earrings are so unusual and such a different and clever idea. I thought the same of the B corporations. The earrings really are quite interesting. I hope they hold up after I actually wear them somewhere! Thanks for your comment! Yes, our Mother’s day is in May here. Still time to come up with a great gift! I am hoping the earrings hold up to actually being worn. Thanks for your comment!